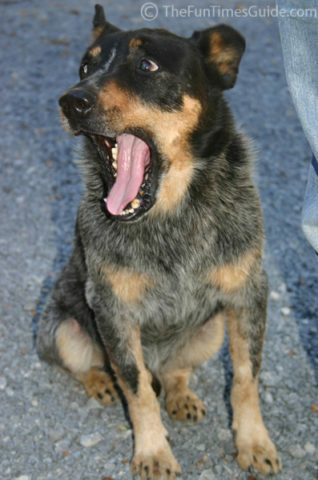 I bet you’re yawning just looking at those first 2 pictures. Ahhh…. 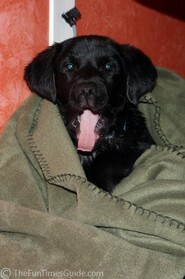 there’s nothing better than being all tucked in on the plush leather sofa! 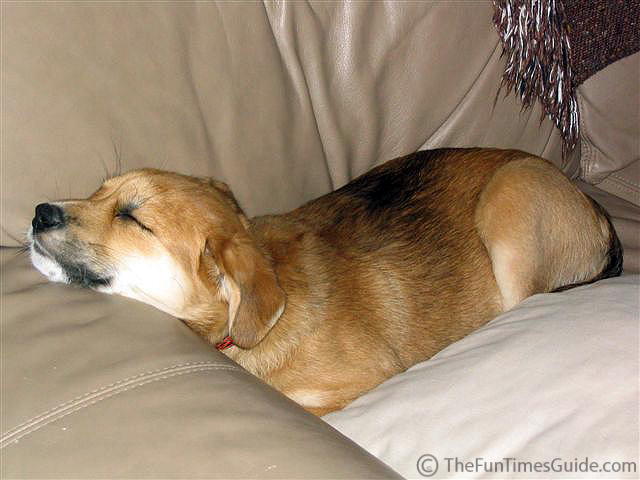 Caught In The Act… of Snoring! This how our dog, Destin, sleeps. As you can see (on the left), he’s all stretched out, and belly up. 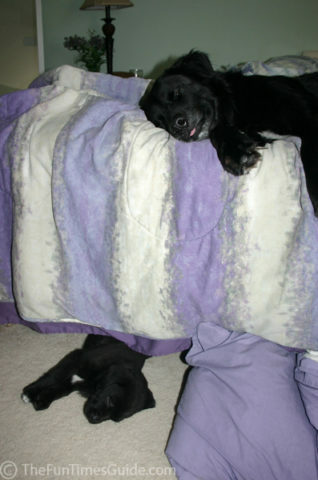 On the right, I had just woken him up trying to snap another picture of his odd sleeping position. On the left, Destin, chose the hard rocks over the soft spot we prepared for him under the tree next to the picnic table. 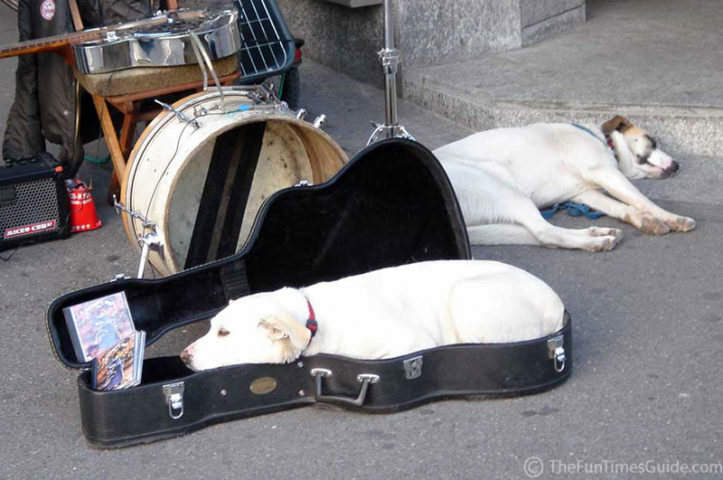 On the right, a guitar case makes perfect sense for a dog bed, right? These two have certainly done their share of bickering (and other forms of sibling rivalry), but when it comes right down to it, they hate to be separated. They sleep together quite often. 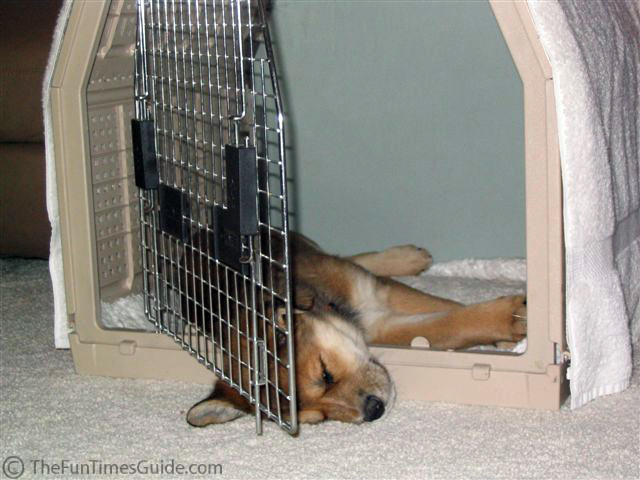 I’d say it’s obvious what Kona’s favorite sleeping position is… whether she’s in the kennel or out! 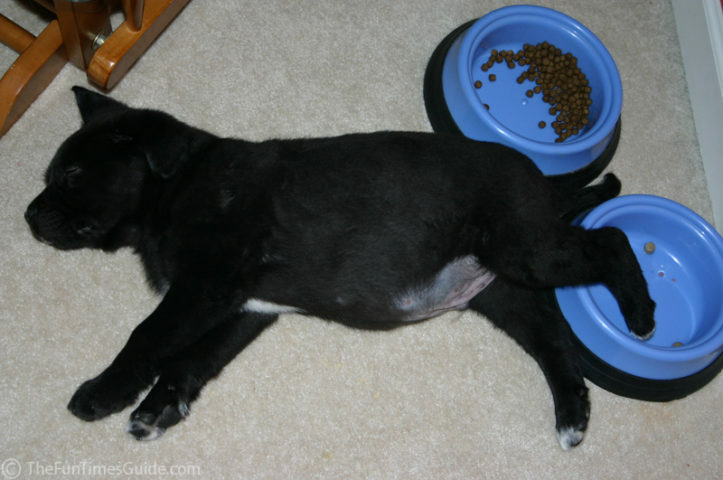 When Tenor was a pup, this is how he typically slept… right near his food bowl. Often, with a foot in the food bowl! I guess he felt he had to protect his stash. Or maybe that was the only place he felt was “his space”. It wasn’t long though until he started hanging out in his kennel instead. Ellie’s pups are just too, too cute. Here, they’re about 3 weeks of age, and sound asleep all huddled together. You know a dog feels loved when they can fall asleep right in your arms. Beth’s dog, Kona, appears to be a belly-up sleeper too. 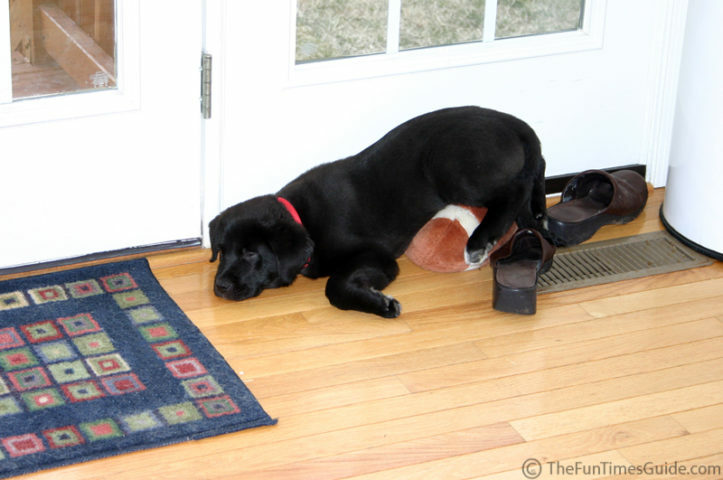 Don’t ask me why, but dogs often seem to pick the most unlikely of places for a little cat-nap. 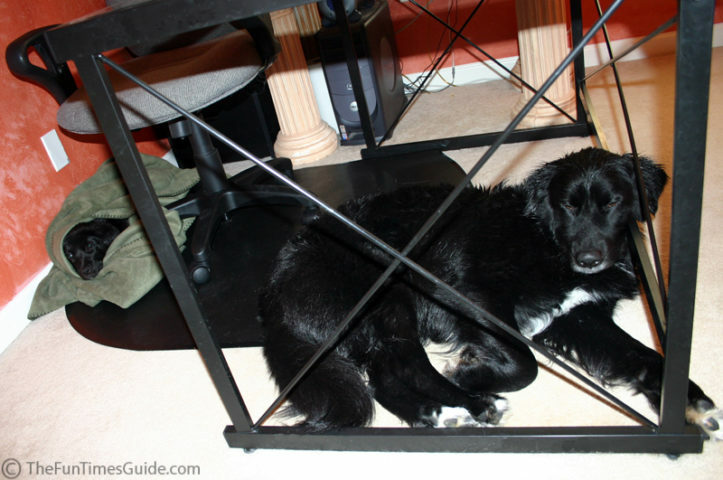 For some reason, our dog Tenor has always had a fondness for sleeping near our feet — usually using the chair’s hard plastic base as a pillow. …Whatever! There’s no escaping the dogs during the day. They follow us around like a shadow. 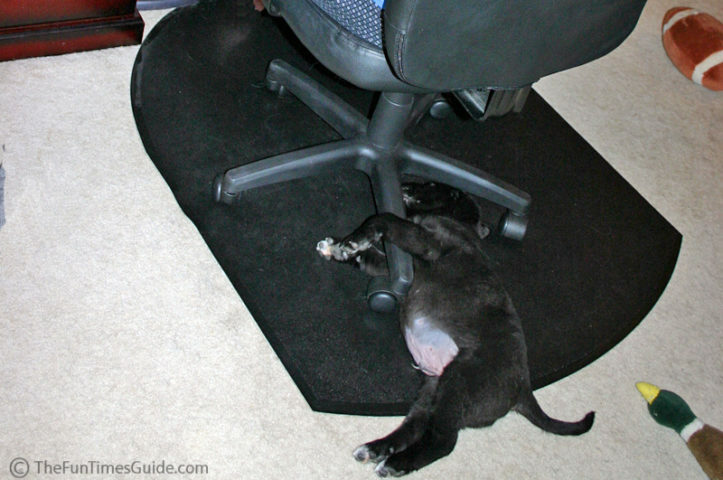 And they’re usually found napping underneath our desks — right at our feet. 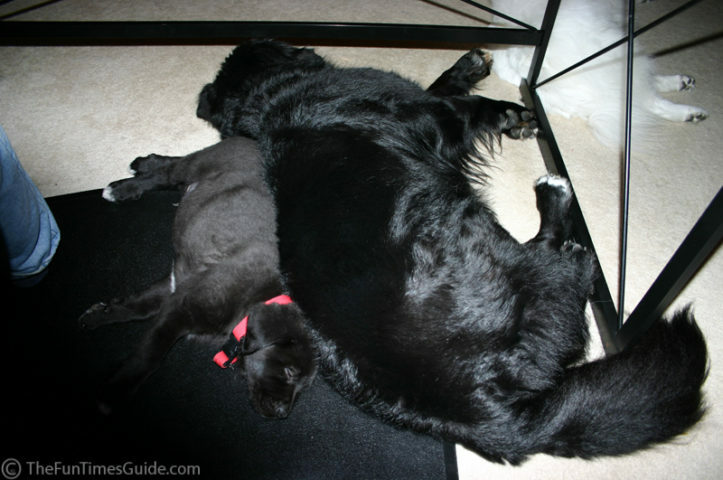 But, you’ve gotta love the fact that they get along so well… usually! On the left: some doggie spooning. 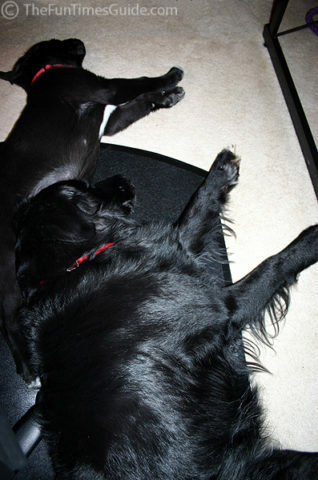 On the right: both dogs sleeping underneath my desk. 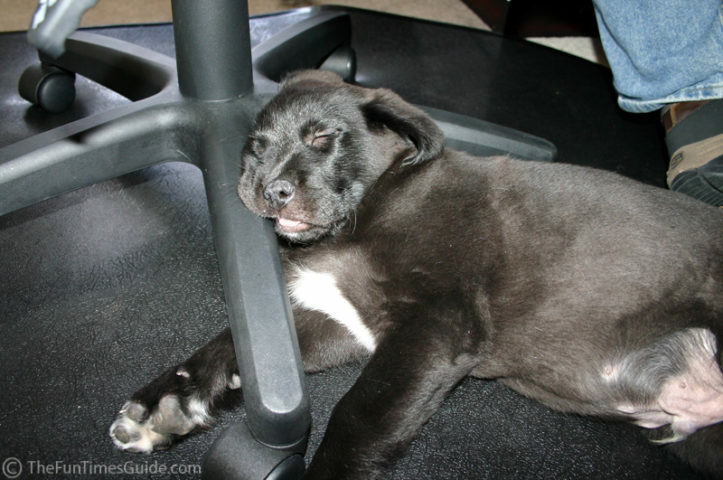 Dogs Can Fall Asleep Anywhere! In a dog’s mind: “Fall asleep whenever and wherever the dog-eared sleepy-eyed gods call ya!” seems to be the norm — at least around our house. On the left: Destin appears to have fallen asleep while keeping a close eye on his little brother, Tenor. 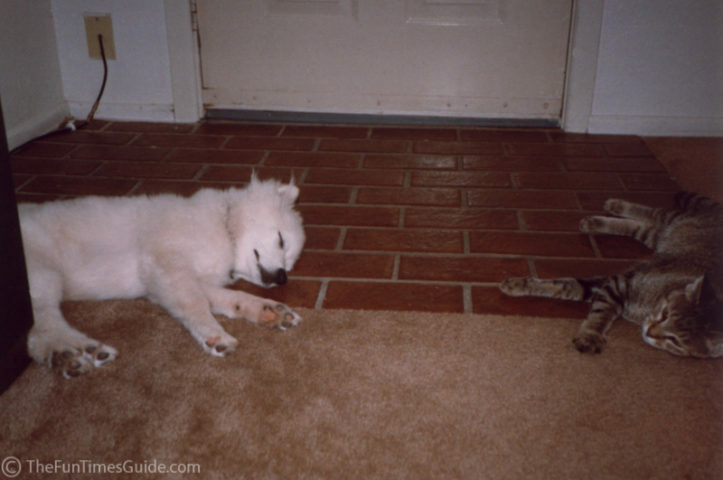 On the right: Tenor was caught using his favorite toy as a pillow (…or a prop). 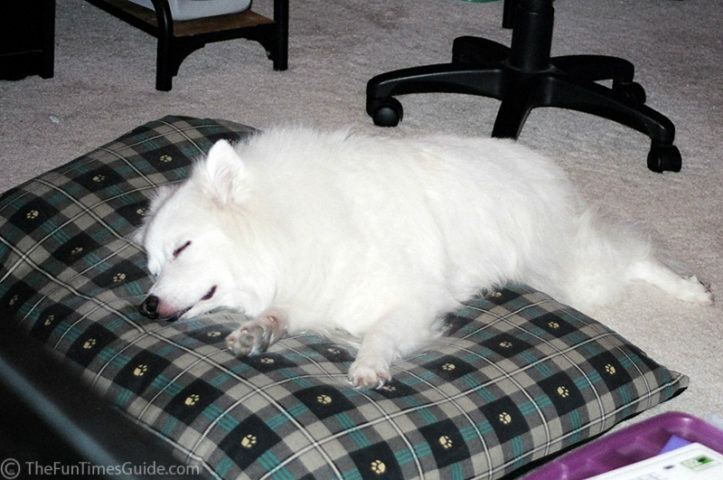 Destin prefers his bed. Tenor prefers ours.